Choosing a YZ250 or YZ250F depends on your goals as a motocross racer, but even more significantly on how deep your pockets are. Building a full-race YZ250F four-stroke cost us $7000 more than building a full-race YZ250 two-stroke. 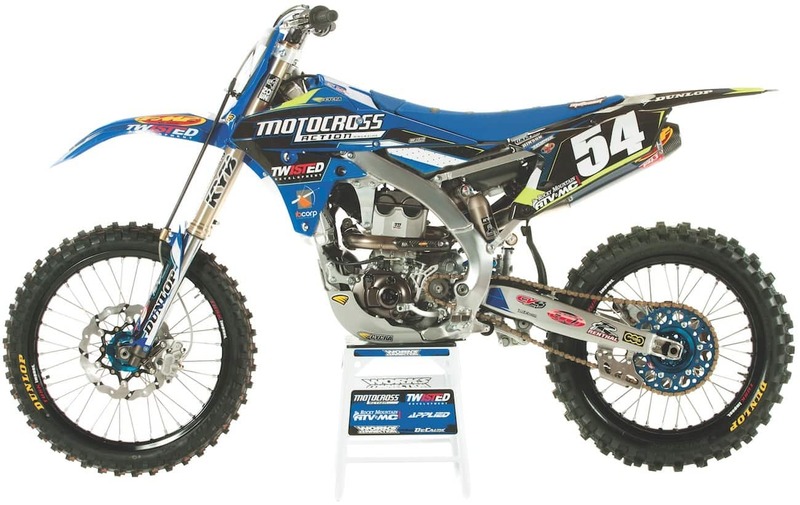 Back in 2010, the MXA wrecking crew did an apples-to-apples comparison between the YZ250 two-stroke and YZ250F four-stroke. No hop-ups, just out-of-the-crate, bone-stock, head-to-head action. At the time, the YZ250 had already been unchanged for half a decade. Nevertheless, the smoker won by a landslide against the thumper. Pound for pound, cc to cc, the two-stroke engine was superior. Well, that’s not 100-percent accurate. We turned our fastest lap times on the smoker, but we also turned our worst laps times on it. It could be faster, but it required lots of skill to be consistent. On the other hand, the YZ250F was like a bank clock—tick-tock, perfect lap times every time. The problem was that no one believed that the YZ250 two-stroke was faster, except for the dedicated old-schoolers. For clarity’s sake, we need to go back in time to understand what has happened in the two-versus-four rivalry. Back in 2002, the Yamaha YZ250F made 32 horsepower, which was 4 horsepower less than the 2010 YZ250F and 14 ponies off the 2010 YZ250 two-stroke. Now, fast-forward to 2017, when the Yamaha YZ250F four-stroke makes 5 horsepower more than it did in 2010 at a hair under 41 ponies. In that 15-year span, from 2002 to 2017, the YZ250F gained a whopping 9 horsepower. As for the YZ250, it stayed stagnant at 46 horsepower. What does this prove? That 16 years ago, maybe even seven years ago, a 250 four-stroke couldn’t beat a 250 two-stroke (if the displacements were the same). Well, the times they are changin’. While two-strokes haven’t gotten a whole lot more powerful, 250 four-strokes keep getting more pumped up with each passing year. By our calculations, Yamaha has averaged a 5-horsepower increase every seven years on the YZ250F. And the 2017 KTM 250SXF is already half-again as close to the YZ250 two-stroke; its 44 horsepower isn’t that far from the YZ250 already. Both hopped-up Yamahas produce 49 horsepower at peak. However, where the power peaks and how broad the powerband is make a bigger difference than how big the peak numbers are. Rather than wait for Yamaha to build a 46-horsepower YZ250F, we decided to take a quick shortcut via Jamie Ellis’ Twisted Development race shop. Jamie is what you would call a top-notch, first-class, grade-A, blue-chip, five-star, under-the-radar engine builder who has been involved in multiple AMA championships. You won’t see a Twisted Development logo on the championship bikes that these big-name riders are riding. Jamie works as a consultant. He refuses to pay these teams for logo placement. Heck, he doesn’t even give out free work to these top teams and riders. Why? Because they come to him. We already know that he can produce a 49-horsepower YZ250F. We know because we’ve tested it. When we told Jamie about our idea of running a hopped-up 250 four-stroke against a stock YZ250 two-stroke—because that would give the two parity in horsepower—Jamie said, “It wouldn’t be a fair fight. The advantage will shift to the YZ250F if you do that. 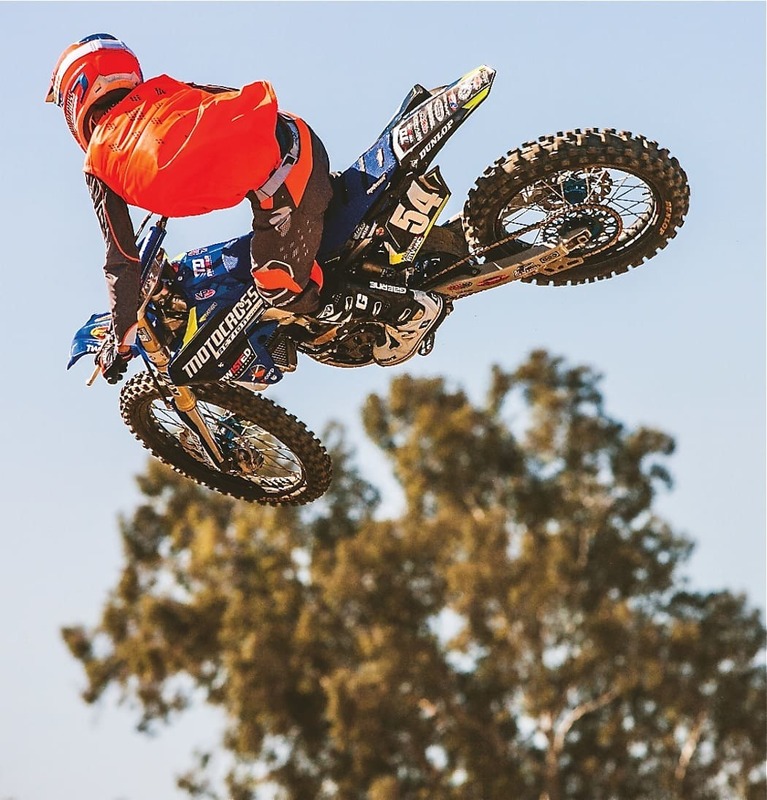 You need to compare a hopped-up two-stroke against a hopped-up four-stroke to get the answer you are looking for.” Then Jamie said, “I’ll modify the YZ250 two-stroke.” Wait, what? Jamie took a beat-up 2007 YZ250 two-stroke, which is the same as the 2017 YZ250, save for the plastics, and rebuilt it from scratch while adding his secret sauce to the engine. Let the battle begin! Twisted Development’s dual-fuel Yamaha YZ250F engine is the meat and potatoes of the AMA Supercross and National series. If you want you YZ250F to run with the Geico, Troy Lee and Pro Circuit bikes, the trickery comes from Jamie Ellis. The Yamaha YZ250F Jamie built for us was the crème de la crème. No expense was spared. 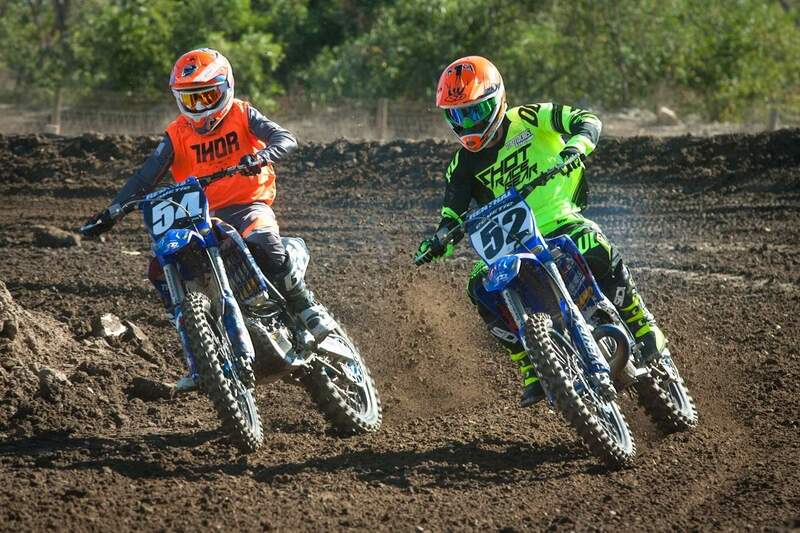 It was made to go head to head against the factory bikes on the Supercross circuit. Not possible? Jamie’s not worried. He knows top-level teams hold their engine development close to their chests. This is where Jamie has a niche market. He will give anyone the best engine money can buy, just as long as they can front the cash. It comes with a steep price tag, but Twisted Development has enough engines on the AMA circuit that Jamie can back up his claims. The $7000 price tag for the engine does not included the $1000 Hinson clutch or $1050 FMF exhaust. When it comes to building top-notch thumpers, it is all in the parts. Jamie has his own spec on the piston and cams. The crankshaft was rebuilt by Crank Works. The transmission was sent out for a treatment process to reduce friction, and the bearings were switched out for ceramic. Probably the coolest feature of the bike is the dual-fuel injector system that he borrowed from Kawasaki to use on other brands. The second injector is mounted upstream in the airbox. Jamie didn’t have luck with a second injector right off the bat, but he knew the theory had potential. So, he went out and bought more than 10 different injectors and spent months testing them. Each injector had a different spray pattern—from sharp pin-like sprays to fine mist sprays. The sweep of the sprays varied from 35 to 45 degrees. Jamie found the potential he was looking for with a 25-degree spray pattern. This patten filled the velocity stack and tricked it into thinking the spray duration was longer than it actually was. The second injector is useless without the correct mapping. A Vortex ignition is used in harmony with the dual-fuel injectors. The front injector is programmed to come on at 0- to 25-percent throttle. This injector handles the initial raw fuel to keep the bike from bogging, coughing and stalling. After 25-percent throttle, there is a linear transfer from the front injector to the rear injector, which initially kicks in at 33-percent throttle. Output is based on throttle position and rpm, so the engine can benefit from the increased upstream atomization. Bottom line: the raw droplets that were being sprayed really close to the throttle body now become a fog of fuel, making the gas more volatile. The atomization of the second injector fills the chamber, making the fuel easier to ignite. If the powers-that-be in Pro racing were smart enough to allow equal displacement rules so that 250 two-strokes could race against 250 four-strokes, racers would have the choice between hideosuly expensive and affordable machinery. But nobody at the alphabet organizations wants that. A ten-year-old bike, a five-year-old bike or brand new off the showroom floor—it doesn’t matter which Yamaha YZ250 two-stroke you start with, they are all inherently the same (with minor mods). If you don’t have deep pockets but want to compete at the highest level, buy a YZ250 two-stroke. These bikes, on the AMA Amateur level, can be raced in the 250F class. Just this year at Loretta Lynn’s, a kid won the 250 C class on a YZ250 two-stroke and left a howling pack of 250 thumpers in his wake. The 10-year-old, beat-up, 2007 YZ250 two-stroke we started with was rebuilt from the ground up into a new machine. Jamie even made it look like a 2017 YZ250 by using Applied triple clamps to retrofit the updated YZ front fender, bolted on the newest airbox (which slides right on) and beautified the rest of the bike with a Cycra Powerflow kit. As for the engine, he didn’t go whole hog. He wanted it to be both affordable and powerful. The price tag? $1200 and change. Jamie blue-printed the engine to match everything perfectly. The cases were textured, the cylinder ported and a Twisted Development spec piston was used. The biggest difference was achieved by using a second base gasket and taking the same thickness out of the head to get it back to stock compression so pump gas could be used after raising the port timing. Jamie also put in a bulletproof Hinson clutch, which ran another $1000. What was the pony power with the added mods? Surprise! The hopped-up YZ250 peaked at 49 horsepower at 8500 rpm, while the YZ250F peaked at 49 horsepower at 13,500 rpm. The kicker was that the YZ250 two-stroke had 9 more foot-pounds of torque than the thumper. Those kinds of torque numbers are game-changers. For the MXA wrecking crew, this was Rocky versus Ivan Drago all over again. A high-tech thumper against an old-dog smoker. The MXA test riders went out on the YZ250 two-stroke first. Each rider had a blast. The power was strong, playful and easy to ride. The light engine braking of the smoker allowed the bike to flow with ease around the track. It got over all the jumps with no trouble—although, as with any two-stroke, getting all the power to the ground can be challenging on certain types of dirt. In slick or hard-packed conditions, keeping the rear tire under control requires a deft hand. In deep loam or sand, test riders could just hold the throttle wide open, dump the clutch and power through without missing a beat. When our test riders jumped on the YZ250F, they looked like fish out of water. They were coming up short on jumps, bogging out of corners and missing their lines. All of them came in after the first round declaring the smoker the unanimous winner. The thumper was described as awkward and low on power when compared to the snappy two-stroke. We sent them back out on the YZ250 smoker for a second time. Every test rider had the same feeling as before, but could sense places where the four-stroke was better. Again, following the prescribed pattern, the test riders switched back to the YZ250F four-stroke. We told the test riders to take their time getting used to the bikes after the swaps. They switched back to the thumper and took some extra time on it. Lap after lap, each rider looked more and more comfortable. Each of them came in after the second round to proclaim the thumper the winner! Everyone was laughing at the confused results. How was the smoker, just minutes ago, light years better than the thumper, and now it was the other way around? They kept going back and forth until they could reach a solid conclusion. Contrary to popular opinion, the YZ250 two-stroke that Twisted Development built for MXA had 10 more foot-pounds of torque than the YZ250F four-stroke. The torque accentuated the power on the exit of corners, and we didn’t need to use the clutch as much as on the stocker. The two engines might have the same peak power, but the power curves are worlds apart. The YZ250 two-stroke signs off 5000 rpm sooner than the thumper. It has a power-now feeling. It hits hard, signs off fast and uses its burst of torque to shoot it out of corners. You can be lazy or ride a gear high without paying a penalty. It should be noted that if you raced a built-to-the-hilt YZ250F the way you have to ride a YZ250 two-stroke, you’d auger a hole in the ground somewhere on the first lap. The two-stroke was go-for-broke, while the four-stroke required a more calculated approach. It was hard for the test riders to switch mindsets as they switched bikes—but once they rode the thumper the way it needed to be ridden, they liked it. One required you to unlock your brain and the other to clamp down on it. The MXA testers were shifting the YZ250F around 11 grand, because it felt as if the power leveled off, which, in a way, it did. So, they shifted early, thinking there was nothing left on the table. Little did they know that when they passed the 11 grand mark, the bike hit its afterburners. They were leaving more than three ponies on the table. The burst of power from 11,000 to 13,500 rpm was incredible—thanks to the second injector. And when shifted at peak rpm, the bike would be right in the meat of its best power. The YZ250F’s burst of power from 11,000 to 13,500 rpm was incredible—thanks to the second injector. And when shifted at peak rpm, the bike would be right in the meat of its best power. The test riders were enamored with the sheer power of the Twisted Development-built YZ250F. They had to shift up and rev the engine out until their eyes bled, which made the engine feel a lot like a KTM 350SXF engine. When they learned to ride it where the power was, the test riders started to get further over the jumps than on the smoker. In hard-packed conditions, the thumper tracked the ground like it had glue on its tires, whereas the smoker would try to break loose. As a bonus, you could be lazy and make mistakes on the four-stroke and the power would be right there at your fingertips. On the track, it was hard to feel the big difference in torque between the two bikes. The added torque did make the smoker easier to ride, but it was still harder to ride than the four-stroke. Both of the Yamahas’ suspension components were reworked by Enzo. The thumper was equipped with A-Kit components. They both handled incredibly better than they did in stock trim, but the newer YZ250F chassis made all the difference in straight-line stability and precision cornering. Our testers liked the narrow feel of the YZ250. Other than that, the YZ250F thumper was superior in its ergos. Twisted Development’s YZ250F four-stroke revved to the moon and hit the afterburners 5000 rpm after the YZ250 two-stroke engine signed off. To be honest, it really comes down to how deep your pockets are. 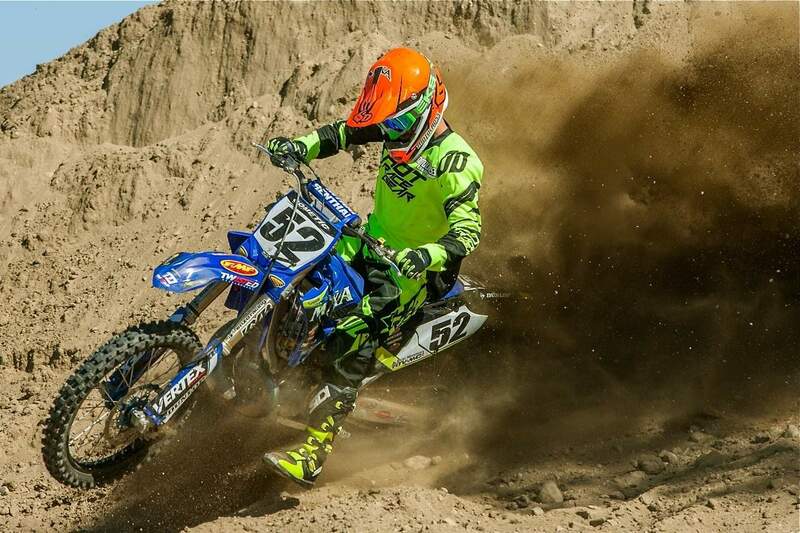 If you are looking for a close-to-50-horsepower racing engine, go with the YZ250 two-stroke. It is mechanically simple, cheap to repair, easy to hop-up and is competitive with top-dollar factory equipment for a fraction of the price. It is great for the guy on a budget who wants to have fun and be competitive at the local level. The problem with the YZ250 is that it is built on an antiquated chassis. It’s not just the YZ250 engine that is 10 years old, but the frame geometry and layout are also way past their primes. But, if cost is a factor, the Yamaha YZ250 is your weapon of choice. The 2017 YZ250F four-stroke triumphs over the old smoker in the handling, turning and ergonomics departments. Those are things that can’t be fixed on the two-stoke. To reach the peak, Jamie’s duel-injection YZ250F engine is the answer. This bike is a powerhouse. We have tested Cooper Webb’s outdoor engine, and Jamie’s engine is on a par with Coop’s. It is downright impressive what Jamie does out of his small but mighty Twisted Development shop. The 7000-dollar question is whether or not you can afford it, plus the additional cost of the YZ250F, which will set you back a lot more than a 10-year-old YZ250 smoker—and become obsolete in quick order. No racer would ever dream of buying a used 10-year-old four-stroke. 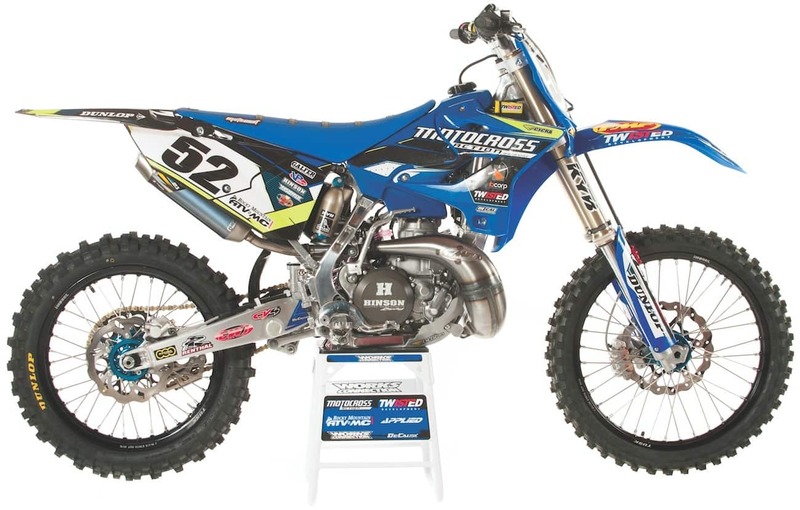 If you are looking for a close-to-50-horsepower racing engine, go with the YZ250 two-stroke. It is mechanically simple, cheap to repair, easy to hop-up and is competitive with top-dollar factory equipment for a fraction of the price. But, you came here to find out which is better—two or four? And, the answer is simple. If you are into the sport of motocross for the fun of it, the YZ250 two-stroke wins hands down. Its power delivery is exceptional. The thrill factor is off the wall, and it delivers maximum horsepower at a cost anyone can afford. For pennies on the dollar, you can have the fastest bike in your class (an in amateur racing the YZ250 is legal to race against YZ250Fs). What you save will keep you racing for a whole year compared to the cost involved in four-stroke racing. However, if you think you are on the fast track to National stardom, you need to stay away from the Yamaha YZ250 two-stroke. That isn’t what the factory teams race—and thus anyone on a smoker obviously isn’t trying to impress the team scouts. Since the “Big Four” sell 250 four-strokes, they won’t help a racer on a two-stroke. There is no upside to sponsoring riders on two-strokes that will make their four-strokes look bad. So, if you want a factory support ride, you have to race a four-stroke. This shootout is not a tie; it’s just not cut-and-dry. If every motocross racer had a 250 two-stroke option that was status-backed, not sneered at, our sport would be healthier. More people could afford to ride, and those who are riding now could afford to fix an engine failure for one-quarter the cost of fixing a money-sucking four-banger. But, you can’t take status, image and self-worth out of the racing formula. Thus, the 250 four-stroke is the perfect machine for riders who are less willing to risk their ego on an unpopular choice. The tie can’t be broken by the MXA wrecking crew—only by the face in the mirror, money in the bank and need for acceptance.